If you are looking for a professional strength drop inlet filter, look no further than the Dandy Curb Bag. This product is designed and patented for use on both gutter and curb inlets to remove the most difficult sediments that are formed in stormwater. With the slowed flow, these solids are settled out and grabbed by this tough Dandy Curb Bag before getting into the inlet. 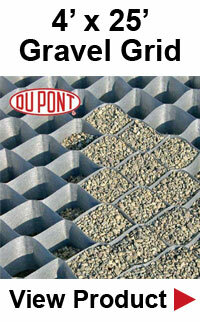 • This excellent design will keep silt, sediment, and debris out of your storm systems. • Easily adapts to the curb's shape. • Has a built-in protective overflow design. • Eliminates and reduces the need to flush or clean the inlets. • Available in different sizes to fit any curb or gutter inlet. • Very easy to install, maintain, reuse, and inspect. • With the grate standing on end, place the Dandy Curb Bag over it. • If using the option oil absorbents, place the absorbent pillow on the bottom of the grate pouch. • Attach the absorbent pillow to the tether loop. • Tuck the enclosure flap inside to completely enclose the grate. completely on straps to support the weight of the grate. • Lower the back edge into place. If installed properly, the Dandy Curb Bag should partially block the curb hood. • As needed, remove sediment that has accumulated inside the containment area. • If using the optional oil absorbent, remove and replace the pillow when it nears saturation. This is the flagship drop inlet filter bag of the company because it is perfectly designed to be exceptionally strong and durable. 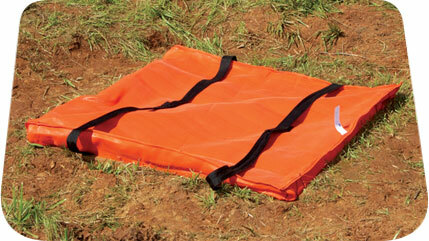 This bag works on flat, rounded, and mountable curbs to filter sludge loaded water. The solids will settle out of the slowed flow and then captured before making it to the inlet. You will get a regulatory compliance performance each and every time. • Designed to keep sediment, silt, and debris out of your storm system. • Eliminates or reduces the need to clean and flush the inlets. • Made from a very visible orange monofilament geotextile for easy visibility in all weather. • Available in all sizes to fit any inlet. • Can be used many times over. • With the grate standing on end, place the empty bag over the grate. the pillow to the tether loop. • Using the lifting device, carefully place the grate into its frame. Note: Do Not totally rely on the lifting device to support the entire weight of the grate. • Remove all sediment that has accumulated within the containment area when needed. • If using the option oil absorbent, remove and replace the pillow when it is close to saturation. If you want durability, look no further than the Dandy Curb. 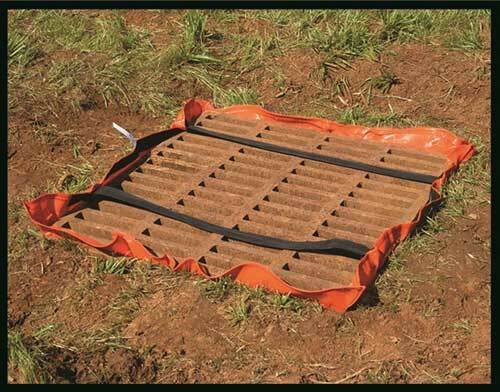 This Dandy Product is designed for curb and median inlets without grates. It is tough enough to handle the worst rainwater loaded with sludge. The sludge will be filtered out and captured before entering the inlet. 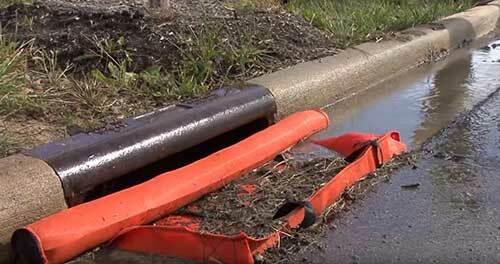 • This patented design will keep debris and silt out of your storm system. • Designed to adapt to the shape of the curb. • Offers a built-in protective overflow design. • Eliminates or reduces the need to clean and flush inlets. • Visibly easy to spot due to its bright orange monofilament geotextile. • Various sizes to fit any curb and inlet. • May be reused many times. • Open the Velcro access pouch that is located on the street side of the unit. • If using the optional oil absorbent, place the sock in the pouch and push it back in. between the Dandy Curb and the surface of the street. • Reseal the Velcro access. • If using the optional oil absorbent, remove and replace the absorbent pillow when close to saturation. This sack was designed to hang under the storm grate to filter even the most difficult sediments. The solids will settle out of the slowed flow and then grabbed by the Dandy Sack before reaching the inlet. The Dandy Sack is a must-have for those difficult sediments. • Internal straps nestle the grate for added support when installing or removing. • The two-foot containment area is very manageable. • Available in 3 standard sizes to fit all inlets. • Optional oil absorbents are available. • Patented curb filtering technology is available. • From the catch basin, remove the grate. • If using the optional oil absorbent, place the absorbent pillow at the bottom of the pouch. • Stand the grate on its end. • To place the grate into the sack, simply lift the top straps out of the way. • Make sure the grate is placed below the top straps and above the bottom straps. • Using the lifting straps, insert the grate into the inlet. • Remove any and all accumulated debris and sediments from the area of the unit after every storm. approximately 1/3 full, empty the unit. • To Empty the Unit – just lift the unit with the lifting straps and remove the grate. • If using the optional oil absorbent, replace the pillow when it is close to saturation.